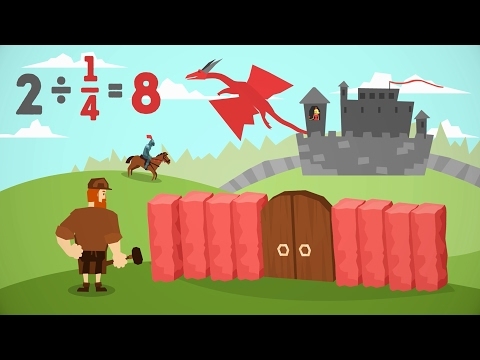 A journey into medieval times is the perfect setting to learn how to divide a whole number by a fraction. Ivan is everyone’s favorite stone mason as he builds walls and seats from blocks of rocks for us to contemplate what it means to divide by a fraction. Meanwhile, in the Kingdom there is a dragon afoot that threatens the peaceful learning process; yet, there is no reason to fear! A rapper knight has come to save the day, protect our wonderful stone mason teacher, and pledge his love to the princess of the land. A journey into medieval times is the perfect setting to learn how to divide a whole number by a fraction. Ivan is everyone favorite stone mason as he builds walls and seats from blocks of rocks for us to contemplate what it means to divide by a fraction. Meanwhile, in the Kingdom there is a dragon afoot that threatens the peaceful learning process; yet, there is no reason to fear! A rapper knight has come to save the day, protect our wonderful stone mason teacher, and pledge his love to the princess of the land.